Skiers traveling the BWCA's Banadad Ski Trail this winter will be greeted midway along the trail by new overnight accommodates. A new twenty foot yurt was erected earlier this fall at Bedew Lake. The new yurt replaces Olga's hut and will serve as the main lodging at the camp. Olga's Yurt will accommodate up to six guest and also provide dining facility for the camp. 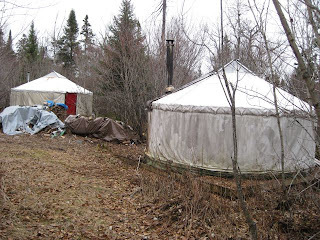 The older Croft yurt will provide additional lodging for another four guests. It is expected that as usual the Banadad Ski Trail should be open by December 15 and the yurts at Bedew Lake will then be officially open for guests traveling the trail.